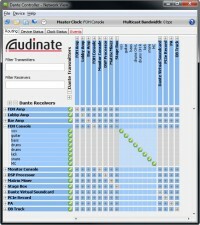 Audinate, the inventors of Dante, the most interoperable digital media networking solution on the market today, is pleased to announce that it’s easy to use Dante Controller software, is now available for a free upgrade download. 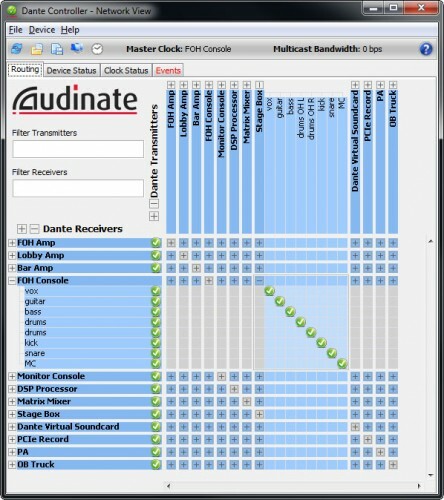 Dante Controller software allows end users to set up and manage audio routes in a network of Dante-enabled devices. V3.4.0 provides a new toolset to better monitor and tune the audio network. It includes: Dante Controller application support of Windows 8 OS (32 or 64 bit); Channel Metering – indicates if audio is present on a given connection and running at a proper audio range; Multicast bandwidth display – indicates the current multicast audio network bandwidth; Clock Health Monitoring – detects and provides a warning if a device is at risk of losing sync with the master clock; Event View – a new ability to monitor the network status, including warning and details of problematic network configuration, communication errors, or other unexpected problems; Mute status – shows if a device has been automatically muted due to clock sync issues. Dante is built on IT standards, and is a complete media networking solution. It delivers a low-latency, tightly synchronized, sample-accurate playback, while simplifying installation and configuration of AV networks. Dante is a proven and scalable system widely deployed in thousands of installations today, ranging from hotels, transportation centers, hotels, shopping centers, public address systems, live sound reinforcement, theatres, concert halls, stadiums, athletic venues, corporate boardrooms, universities, broadcast facilities, recording facilities, houses of worship, government facilities and courtrooms.